Man Utd boss Jose Mourinho has revealed that he remains hopeful of good news on the injury front, but expects to be without key names vs Liverpool. The Red Devils face a crunch clash against their bitter rivals at Anfield on Sunday, and they face a serious problem in defence due to injury troubles. Having already conceded 26 goals in just 16 Premier League games so far this season, giving them the joint-worst defensive record of the top 13 sides in the table, the last thing Mourinho needs is to be left short of options in his backline. Unfortunately for the Portuguese tactician, that’s exactly the problem he faces ahead of the weekend. 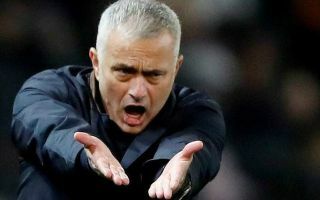 As noted by Sky Sports, Marcos Rojo, Chris Smalling, Diogo Dalot, Matteo Darmian, Luke Shaw and Victor Lindelof are all major doubts to face Liverpool, and so Mourinho will undoubtedly be desperate to see some of them get the green light to feature at least. Time will tell who manages to get clearance from the medical staff to be in contention, but time is certainly running out for them to confirm their availability. As noted by the Manchester Evening News, up to nine players could be missing on Merseyside this weekend, with Scott McTominay, Alexis Sanchez and Anthony Martial also on the injured list. In turn, Mourinho faces an anxious wait to determine who will be part of his match-day squad as United look to not only boost their own hopes of securing a top-four finish this season, but also to put a dent in Liverpool’s title hopes.